Alleged Lynn carjacking victim, 74, with the help of a cane, stops man in his tracks. I was on an off day from work, driving from Somerville to Swampscott, when I heard a call on the police scanner that piqued my curiosity. A man was struggling with another man in a Lynn parking lot. The police dispatcher said something about a possible car theft at that address. I was an eighth of a mile away so I decided to check it out. I saw a couple of good samaritans and an older gentleman named Gordon Parker. I also saw a bloodied suspect. The blood was mostly from a cut above his left eye. 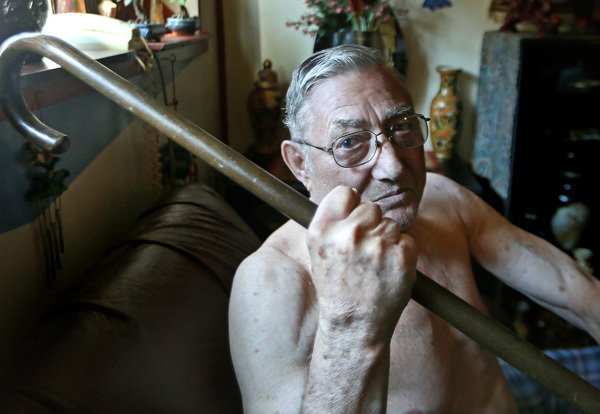 Gordon Parker, 74, used his walking cane to fend off this man. CLICK on top photo for VIDEO of Gordon Parker describing his day. All copyright Mark Garfinkel 2012. Posted in Uncategorized | Comments Off on Alleged Lynn carjacking victim, 74, with the help of a cane, stops man in his tracks. Confirmation of photographic evidence of Wednesday’s funnel cloud over North Shore. 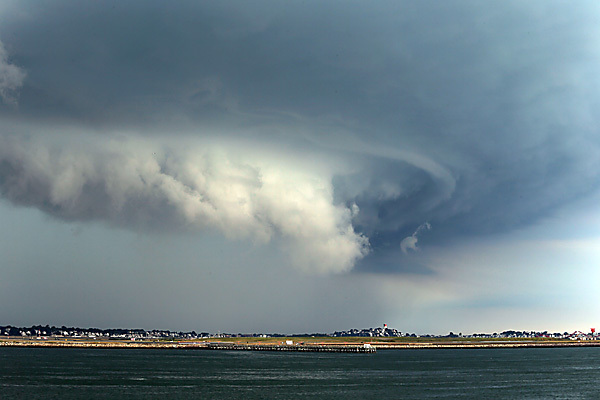 I spoke with the National Weather Service in Taunton today, one day after e-mailing them photos that I snapped of Wednesday’s severe thunderstorm. 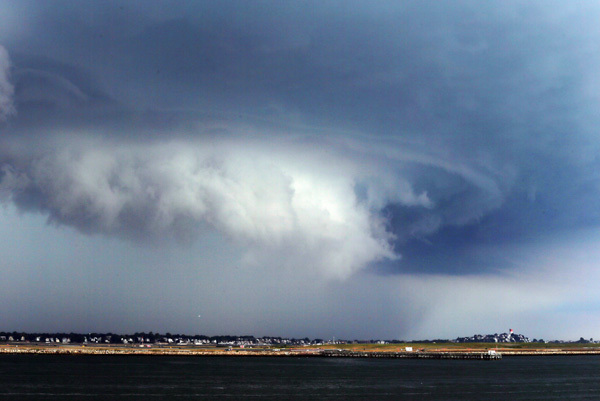 Here is my photo of the probable funnel that was spotted in the air from Woburn to Swampscott. The funnel cloud is the dark, imperfectly shaped funnel at far right in the below photo. Of note is the far reaching “finger” of circulation coming in to the funnel from left to right. 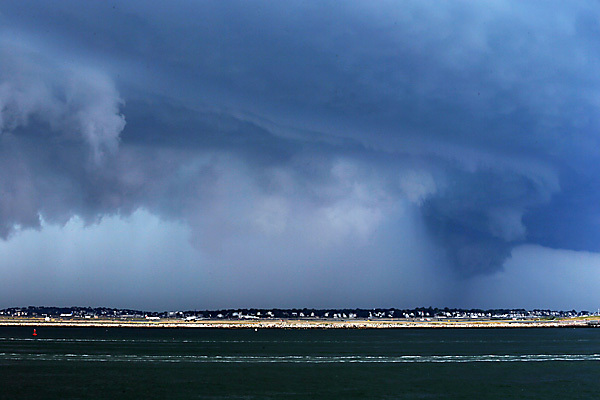 This appears to be over Lynn, Nahant or Swampscott. For more photos of this storm please scroll down to Wednesday’s blog entry. This is my first funnel cloud. I have always wanted to photograph one. 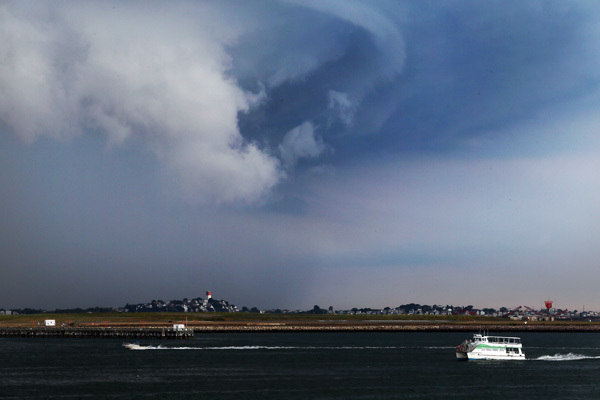 Posted in Uncategorized | Comments Off on Confirmation of photographic evidence of Wednesday’s funnel cloud over North Shore. What was that cloud that I photographed today over the North Shore? I had limited luck in my quest to shoot lightning today. I did however get to see this interesting rotating thunder cell over what appears to be the area from Lynn to Marblehead. These photos coincided with a tornado warning the National Weather Service issued for the Swampscott area. I snapped these photos from near the Black Falcon terminal in South Boston. I’m hoping one of our great area meteorologists might be able to identify what”s going on here. These photos were taken around 2:10pm. 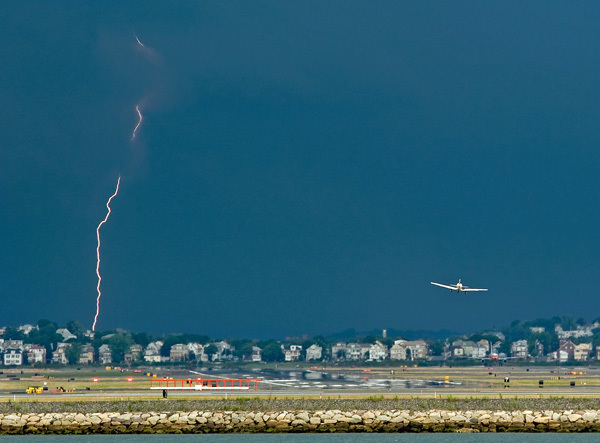 The last photo, of lightning with the small plane, was snapped about 20 minutes prior to the cloud photos. Why is it people step over pennies on the street instead of picking them up? A very nice young lady I know is working for the betterment of our military members and their families by participating in “Penny for your Thoughts.” 13 year old Hanna Fitzgerald, below is working on a Summer project to raise money for the military and their families. Hanna is asking you to do two things. First, mail her a penny. Second, share this with your friends on your wall, tweet, email etc. and entice your friends to do the same. Hanna will be attending the last WWII Marine Reunion of the 4th Amphibian Tractors in NJ, October, 2012, and hopes to have reached enough people to reach her goal of $500.00. Why do we leave our pennies at a register because we don’t want to put them in our pockets? Why do we all have pennies lying on our car floors we ignore? Why do we throw pennies in wishing wells and not nickels, dimes or quarters? Posted in Uncategorized | Comments Off on A penny for your thoughts.